Old world charm with modern comfort. 211 Completely renovated, classically designed bedrooms, 18 of which are Suites. Spacious accommodations with marble bathrooms, practical work desks and advanced technology including wireless internet access. Additionally, all our guests have complimentary access to our fitness facilities. Hilton Antwerp, always above and beyond your expectations. With a total of 2600 square meters of flexible function space including 2000 square meters of congress and exhibition space all conveniently located on the same floor, the Hilton Antwerp is a unique setting for events of all sizes. Hilton Meetings includes 13 meeting rooms for smaller meetings all of which feature natural daylight making them ideal for break outs and smaller meetings as well as having direct access to the Business Center. The Belle Epoque ballroom, with its beautiful, renovated domed roof, dating from 1920, is without a doubt one of the most beautiful ballrooms in Belgium. Near trainstation, Near to the university, Centre, Museum Area, Near the historic centre, Near airport, Near subway / tramstation, Near shopping centre. A variety of options to unwind. The lobby lounge is ideal for afternoon tea and the place to be and be seen. A glass roofed orangerie and large windows make the Brasserie Terrace Café the perfect place to discover creative Belgian Cuisine and enjoy the magnificent views. Step into the luxurious and old world setting of the Maritime Bar and discover one of the 40 single malt whisky's or taste one of our selection of Belgian beers and fantastic cocktails such as our award-winning cocktail '5th avenue' based on vodka with a fresh and a delightful twist. The Hilton Antwerp is located in the heart of Antwerp, the Belgian capital of fashion, also known as the Diamond Centre of the World. 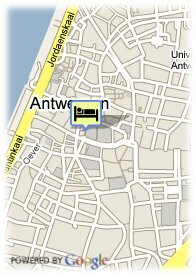 Just a short flight away from the heart of London direct to Antwerp airport. A façade that is a memory to a foregone lifestyle, overlooking the charming Groenplaats with de Cathedral of our Lady and the famous Pieter Paul Rubens statue, Hilton Antwerp is cosmopolitan, dynamic and superb, just like Antwerp itself. An icon of style, the Hilton Antwerp creates a tranquil environment in the centre of a vibrant city. 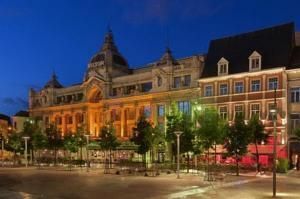 Ideally lacated in the cosmopolitan centre of Antwerp, just steps away from world-class shopping, museums and the magic of picturesque streets. Charming and luxurious.